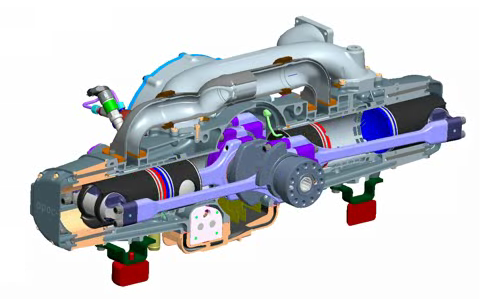 EcoMotors announced today a $23.5 million series B funding round from Khosla Ventures and Bill Gates that the company will use to build and test its eco-friendly engine, known as an Opposed Piston Opposed Cylinder (OPOC) engine. EcoMotors makes engines that run on diesel or gasoline but have greater power density, weigh less and produce lower carbon emissions than conventional engines. OPOC engines are being developed for passenger vehicles, as well as for commercial vehicles, aerospace and power generators. OPOC engines “reduce the cost of transport without requiring any sacrifices by the consumers,” claims EcoMotors CEO Donald Runkle. The engines are designed to work with existing infrastructures to easily replace engines like the four-stroke combustible engines used in many passenger cars. They will also be less expensive than these engines. Runkle expects EcoMotors will be able to first implement its engines in applications like gensets and begin putting OPOC engines in cars within two to three years. The company plans to make money through joint development agreements with existing engine manufacturers, licensing its technology and selling its own engines. Runkle said the investment appealed to Khosla Ventures for its disruptive technology, and to Gates for the engines’ potential applications in developing countries.